OUR HABITS become our character. The thought hits me first thing Saturday morning when, after hitting snooze on my alarm for the fifth time, I darted through the door and elbowed my way through fresh seafood at the weekend wet market. I only mean to say that it’s fast becoming a habit. The profundity of the opening line was purely unintentional. 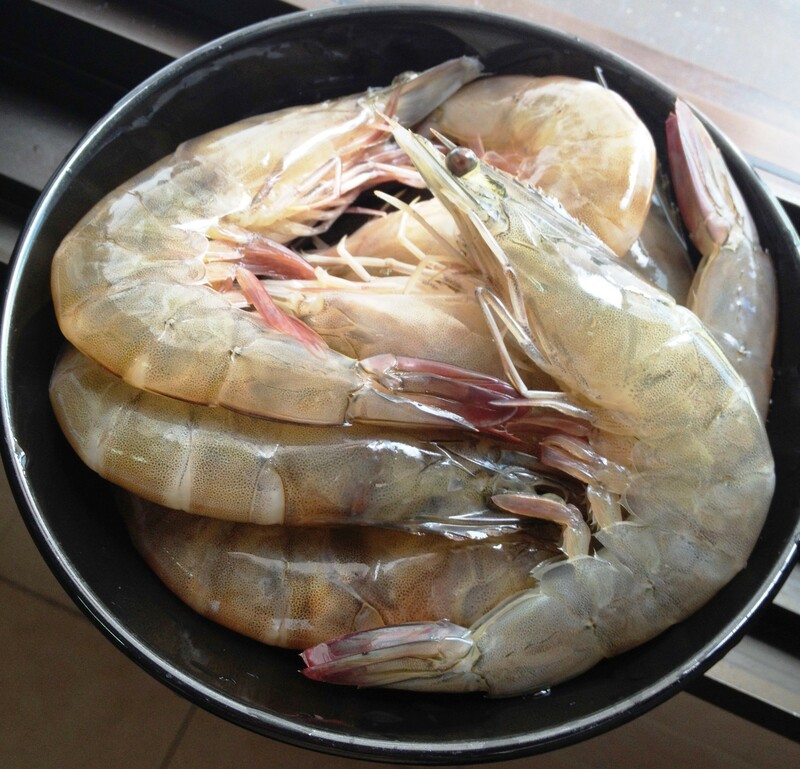 One of my weekend market basket stuffers: Prawns (10/12 Count), fresh, wild–caught, 500 g (SGD 24.00/kg). This one told me she was ready for her close-up! Haha. But if I would be so profound – however unintentional – then I would be better off if I’d cook not only for myself but for a couple of my closest friends as well. 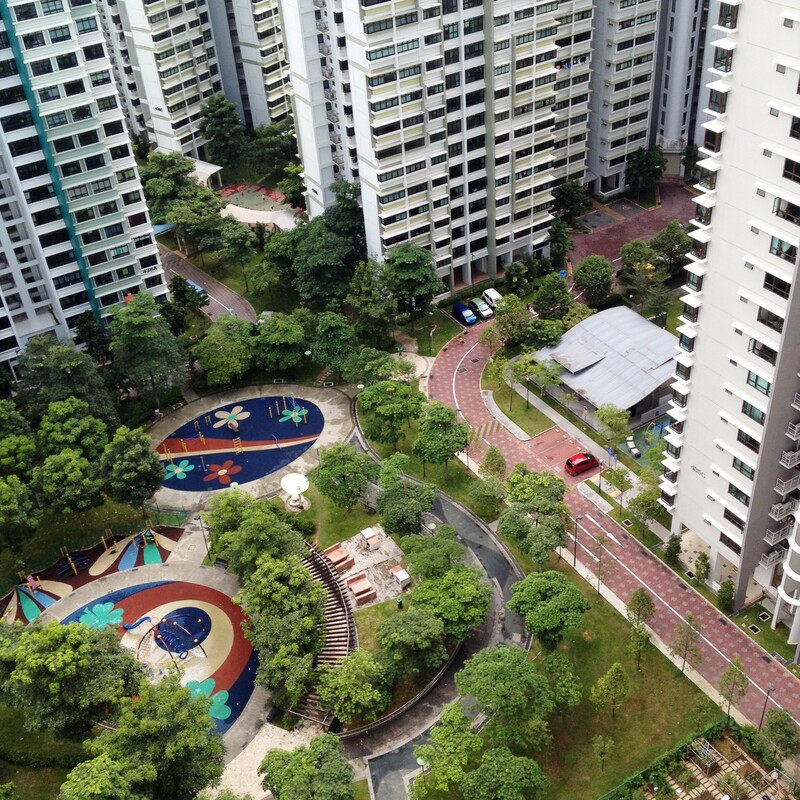 We’ve been moving in very different circles since moving to Singapore. But that didn’t mean we had to lose the friendship. My resuscitated fascination for blue crabs seems to be something I shall enjoy in solitude. Something about having to work really hard for one’s meal – all those legs, claws and shell one has to go through – makes people think twice. So staring at the day’s catch, showcased no better way than spread on white tiles so pedestrian yet so fitting, I had a thought: maximum pleasure for minimum effort. Prawns win over crabs. I made my way through the biggest, fattest fresh prawns, S$ 24.00 for a kilo, making sure that while I work out my ingredients list in my head, I wouldn’t be making my dearest blue crabs feel left out. I snapped up a couple of those too. I thought my friends would appreciate a taste of home. 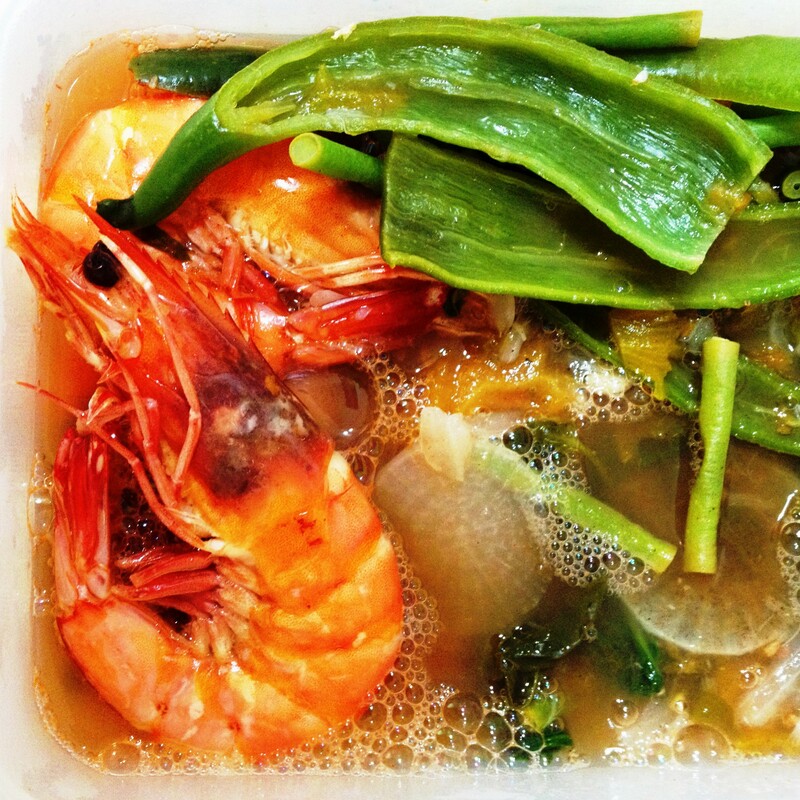 So the prawns just had to be made into “sinigang” – meat or fish in a broth soured traditionally with tamarind pulp, to which are added lots of fresh vegetables. My previous posts about it are here. I realize I haven’t really put up a proper recipe of it here though. Here is exactly how I make it. This being the batch I brought to my friends, blanching the vegetables is a must to preserve their color and crunch as the dish travels. In a stock pot, bring one liter of water, the onions and tomatoes to the boil. Simmer for about five minutes to break the onions and tomatoes into the broth. 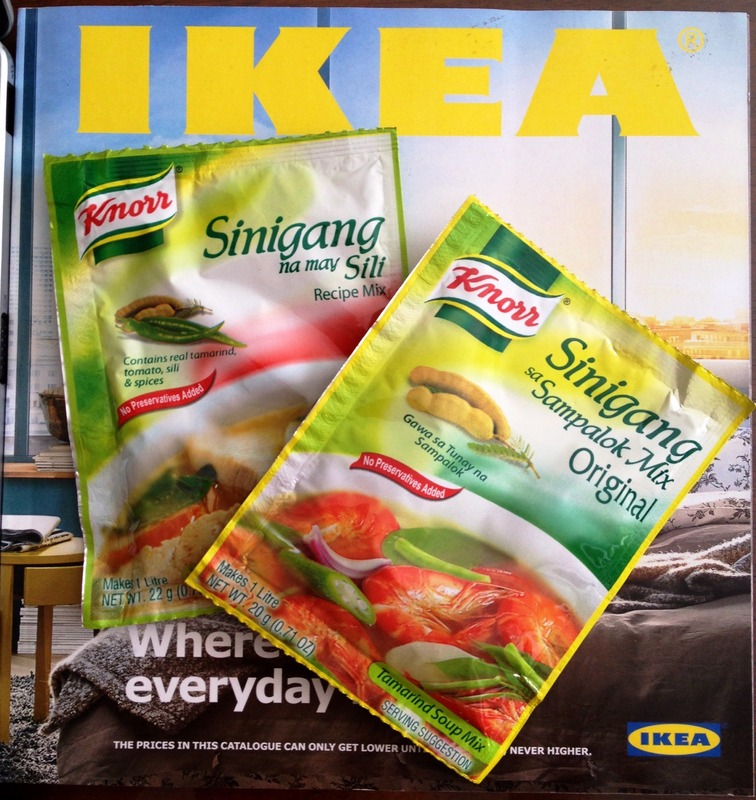 Add the KNORR® “Sinigang sa Sampalok” Mix Original (20 g), or “Sinigang na may Sili” Recipe Mix (22 g). As a kid and as my mother’s kitchen apprentice, I used to prepare the sour broth using fresh tamarind that had to be boiled, mashed, and strained. I call these the convenience of modern times: KNORR® “Sinigang sa Sampalok” Mix Original (20 g), and “Sinigang na may Sili” Recipe Mix (22 g). 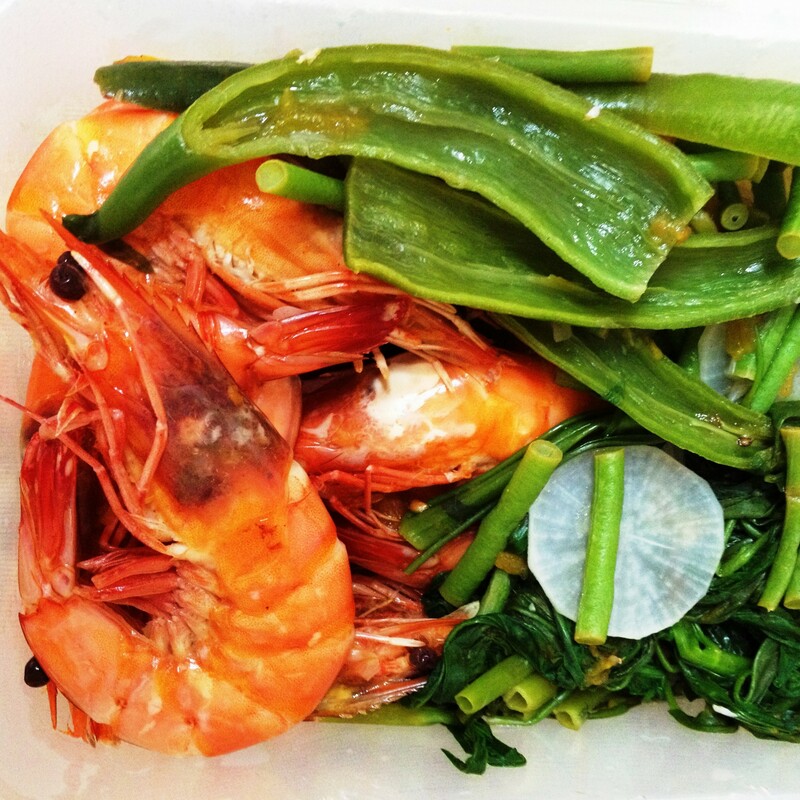 When the prawns start to curl, add the blanched vegetables – string beans, daikon radish, swamp cabbage, and, the green finger chilies. Three minutes after the dish has come back to the boil, turn the heat off. “Sinigang na sugpo” is ready to serve! Preferably, with heaps of freshly cooked, steaming hot Japanese pearl rice. I packed the “sinigang” as beautifully as I could. This batch was made for a VIP clientele and will have to travel from my flat to theirs. I poured the broth and it’s ready to be delivered! 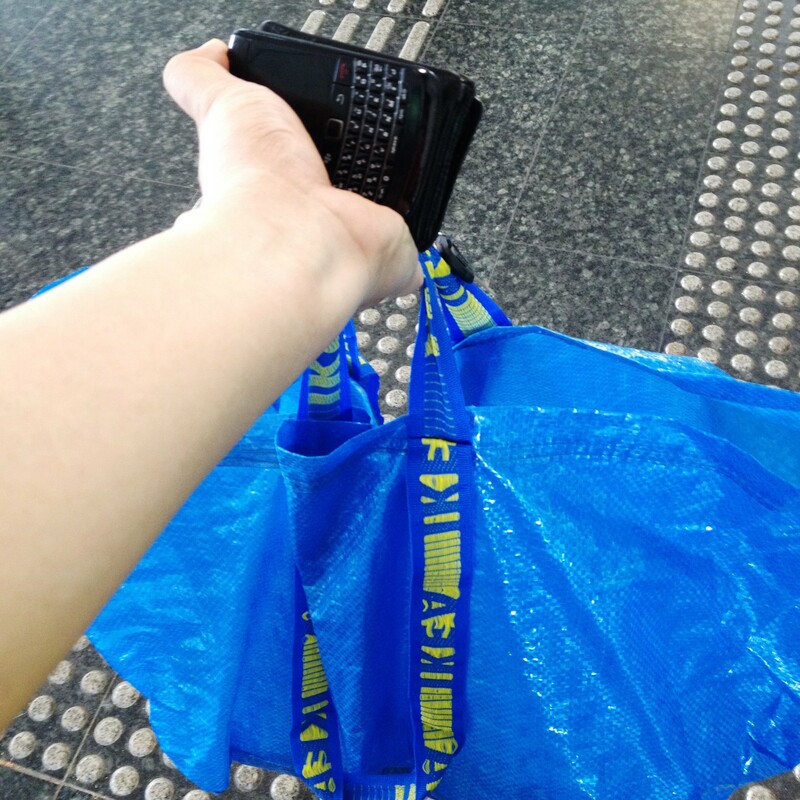 In this IKEA® bag are the “sinigang” and lots of steamed Japanese pearl rice. Just a 10-minute train ride to the VIP client. One of the nice things about living in Singapore. Even a homecooked lunch could be enjoyed with an awesome view. What a very NICE view you have from your home. Just to share, not sure if there is any Sheng Siong Supermart near by your house, they supply fresh seafood..crab crawling in water tank. 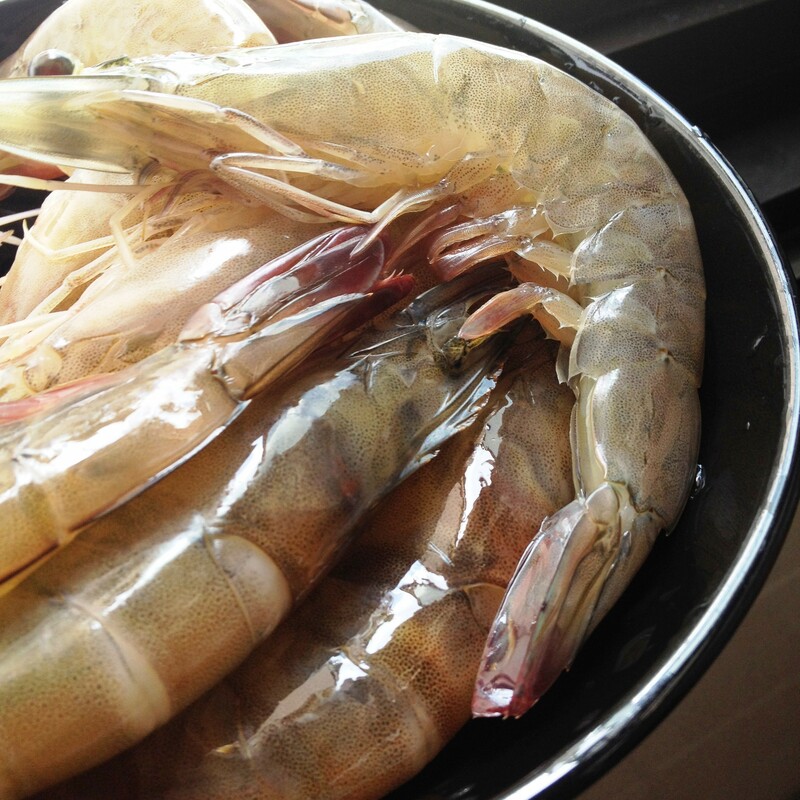 Days just before CNY, you probably can see live prawn swimming in the tank too. Hi Iris! Thanks for the tip. I will give this a try! Need to find a Sheng Siong nearby first. Haha!